Tonosawa Ichinoyu Honkan, a long-established ryokan in Hakone, a prime hot-spring resort not far from Tokyo, is becoming popular with foreigners. Individual foreign travelers now account for 40% of its total clientele. One of the reasons for this support is that reforms at the ryokan aimed at improving “productivity” have led to increased customer satisfaction. Let’s take a look at this new approach of a traditional Japanese-style inn. After an uphill walk of about 10 minutes along National Highway No. 1 from Hakone-Yumoto Station, a busy transportation hub, the Tonosawa area comes into view, with its civil engineering heritage, including a bridge constructed in the early Showa period (1926–89), and inns designated by the state as tangible cultural properties. The view might not be so unusual for Japanese, but in the eyes of foreigners, it is very much a scene of Japan in bygone days. Go a little farther, and you really do feel as if you are walking in a theme park. Guests are welcomed by the ryokan’s imposing entrance. 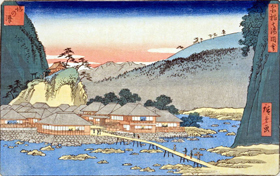 This print of the late Edo period by Utagawa Hiroshige (1797–1858) shows the Ichinoyu inn (on the right of the bridge). 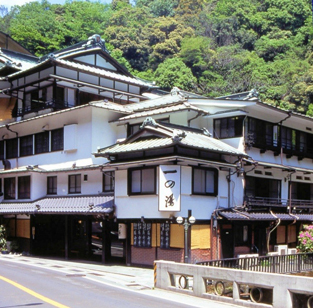 The first ryokan to be opened in this district, in 1630, was Ichinoyu (literally, “first hot spring”). The present building, a wooden structure dating from the Meiji period (1868–1912), still maintains adequate sturdiness even when measured against current architectural laws and ordinances. At present the ryokan has 21 guest rooms, all of which are built differently from the others. Many guests, both Japanese and foreign, visit the ryokan repeatedly so that they can enjoy staying in its differently designed rooms. 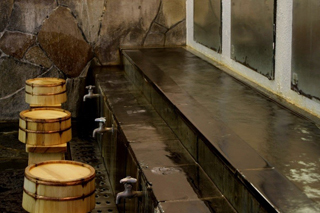 Foreigners also like the alkaline water of Tonosawa hot spring, which is said to be good for the skin, and enjoy soaking, at their own pace, in the outdoor baths attached to guest rooms or the large common bath. 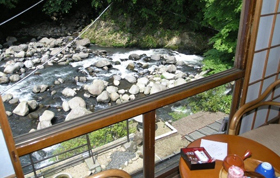 The facilities inside the ryokan, and the view from the guest rooms looking down over a river, give a feeling of traveling back in time to retro Japan. All the guest rooms, with their old-fashioned elegance, look down over a ravine. 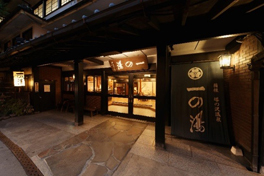 Tonosawa Ichinoyu Honkan enables guests to experience staying in a historic building, but to maintain competitiveness, it also needs to keep prices down. As a trade-off, therefore, it has done away with a proprietress, footwear attendants, room maids, and chefs. 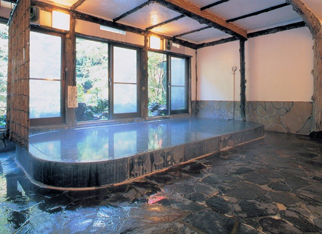 It has selected the services that a ryokan needs to offer and concentrated on them. retains the style of the Taisho period (1912–26). Ichinoyu encourages foreigners to act in the same way that Japanese usually do. And it turns out that foreign guests actually do enjoy wearing yukata, laying their own futon, eating shabu-shabu, and so on. Although some Japanese did not like the idea of having to lay their own futon, foreign guests just assumed that was the way things were done. 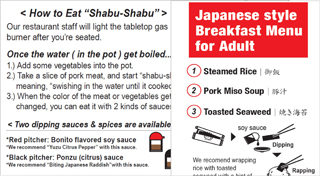 The English-language information kit contains illustrated explanations of how to lay futon and how to wear yukata. Ichinoyu feels strongly that foreign guests should not be given special treatment. It is considered only natural that foreigners should be served the same things as Japanese, and indeed foreigners who come all the way to this ryokan seem to like it. 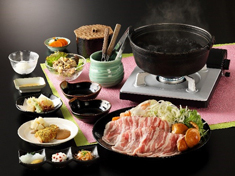 Many ryokan serve Western food to foreigners, but Ichinoyu recommends that they be given Japanese food. As a Japanese ryokan, Ichinoyu does not wish to stray from the distinctive food that it offers. It was not the case of improvements being made with foreign guests in mind from the start. First of all, the changes targeted Japanese guests, who took a liking to them. The ryokan thus became popular among Japanese, and then gradually foreigners began to notice the fact and jump on the bandwagon. The underlying tenet here was that a ryokan definitely cannot survive unless it provides good services that delight Japanese. At one time there were many ryokan trying to attract guests with ninja or samurai presented in a modern style, but such an approach does not interest Japanese at all. Rather than catering to such trivial tastes, Ichinoyu sought to be a modest ryokan where guests can enjoy a real experience of Japan. 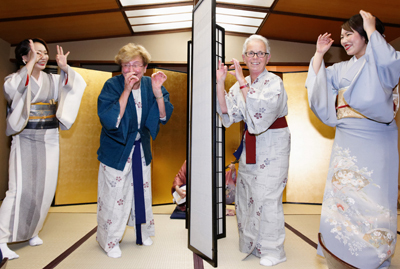 Foreign guests enjoy parlor games with geisha. 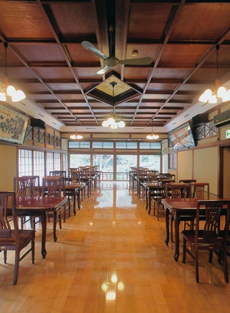 Ichinoyu was the first ryokan group in Hakone to commercialize set plans with other tourist resources in the vicinity. The plan established in collaboration with geisha enables many foreigners to enjoy Japanese culture at a reasonable price. The program is composed so as to gradually shorten the distance between the foreigners and the geisha. First of all, the geisha perform song and dance on a stage; then they play games together; finally, the party ends with everyone posing together for photos. Other set plans, which contribute to regional vitalization, include harvesting mikan oranges, fishing for pond smelt, crafting marquetry, and visiting art galleries. 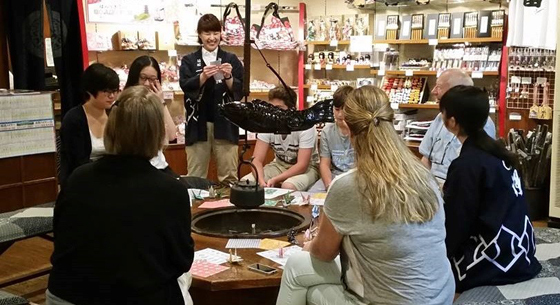 A staff member shows foreigners how to make a crane origami. As soon as the ryokan states that this is hospitality, it ceases to be hospitality. Ichinoyu has created a situation in which there is no waste, so when a guest requests something, it can respond. Hospitality is something that takes shape naturally, by understanding what the guest needs and by showing the guest clearly what is not necessary. Never replying “No” to a request, Ichinoyu always endeavors to propose an alternative. 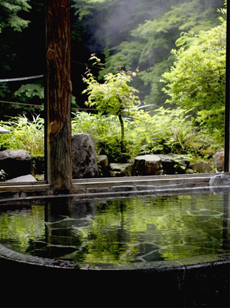 The large common bath does not have showers; bathers use pails of warm agariyu water to rinse themselves. 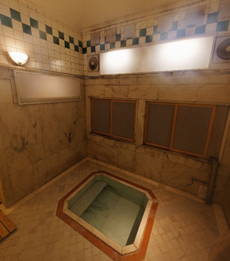 The free marble family bath has been in use since the Taisho period. The word behind all this action is “productivity.” To many people, “productivity” might be a cold term conjuring up the image of cuts, but actually the opposite is true. It is through the maintenance of productivity that hospitality becomes possible. A venerable establishment is usually deemed to be one that cherishes a tradition and continues to apply the same methods for a long time, but throughout its 388-year history Ichinoyu has been constantly making new challenges. The ryokan has been able to continue for nearly four centuries because of its DNA, which is a rich concentration of this know-how. It could not have survived through the ages just by continuing to play the same old game. A venerable establishment lasts by going on the offensive, not the defensive. Tonosawa Ichinoyu Honkan is a hybrid of old and new. 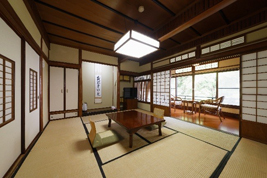 Popular designs of the Meiji, Taisho, and Showa periods can still be seen here and there, and one guest room built in Meiji times is still in use today just as it was then. But at the same time, management of the ryokan is supported by the modern information and communication technology, including online reservations and a system of frequently asked questions utilizing the latest artificial intelligence. 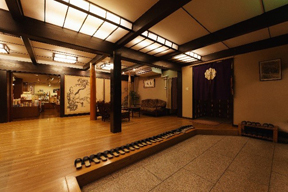 Externally, the building itself, which is registered as a tangible cultural property, is old, but internally, the ryokan is kept going by state-of-the-art instruments. It is in this way that Ichinoyu’s DNA is being carried on. The ryokan’s popularity among foreigners has been achieved through the accumulated implementation of individual measures taken without losing sight of what needs to be done. It is certainly a well-established inn with an excellent location, but it has not done anything special and has not invested any large amounts of money. This is a place where staff members, working under a code of conduct emphasizing productivity improvement, act in unison and with the same feelings.